A small application that helps you quickly answer the type of security questions where you are required to give certain letters of your password but not the whole password. It is particularly useful when used in conjunction with a password vault where you can cut & paste the full password into PartWord or supply it on the command-line. 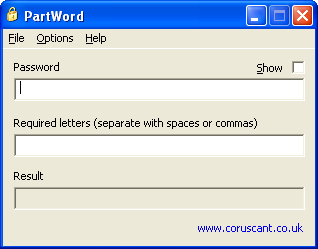 PartWord does not store, transmit, retain or divulge your password in any way. Source code is available. This field lets you specify your password. You can type in this text box, or you can cut & paste your password from someplace else. By default the text is obfuscated with stars to stop "shoulder surfing", but you can check the 'Show' checkbox to show it. PartWord is also possible to specify the password as a command-line parameter. This is the only parameter that PartWord understands and has no switches or modifiers. However, you must enclose any password that has a space in it in quotes, and if your password contains any quote marks then you will be unable to use the command-line. This is a restriction of Windows. This field lets you specify which letters of the password you need. Separate them with spaces and/or commas. Qweas is providing links to PartWord 1.0.1 as a courtesy, and makes no representations regarding PartWord or any other applications or any information related thereto. Any questions, complaints or claims regarding this application PartWord 1.0.1 must be directed to the appropriate software vendor. You may click the publisher link of PartWord on the top of this page to get more details about the vendor.